A global digital expansion of the residential real estate industry is underway. Millions of local residential homes from some of the wealthiest countries around the world are being uploaded for sale onto thousands of Internet-enabled real estate platforms. 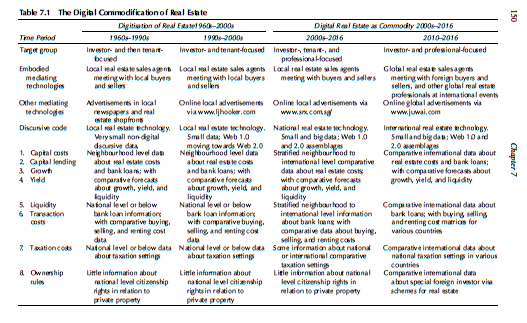 While critical housing scholars and some digital citizenries are abandoning and thinking beyond the technics and mentalities of land and real estate as private property, the globalising real estate industry is digitising, uploading, and “up-scaling” the local real estate technics and mentalities of prior eras onto their new tech products. In the Asia-Pacific, the real estate tech industry has uploaded the real estate technics and mentalities that built the Great Australian Dream. The new real estate technologies are enframed by market-centric and libertarianist real estate technics that readily account for the legal frameworks of different nation states and the cultural and linguistic barriers that previously restricted trans-cultural and trans-national real estate sales. The real estate technology entrepreneurs are building tech products that have libertarianist, private property, and market-centric mentalities built into their very functionality.